McCumber was the youngest winner of Jacksonville’s JAGA Championship in 1965 at age 14. He won more than 15 mini-tour events before earning his PGA Tour card in 1978. 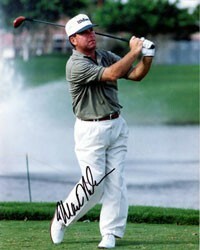 McCumber won 10 Tour events in his 24-year career, including two Doral-Eastern Opens, the 1988 Players Championship, and the 1994 Tour Championship. He has played on two World Cup teams and one Ryder Cup team, and now plays on the Champions Tour. He also has made significant impact in golf-course design with Mark McCumber and Associates, the design arm of McCumber Golf.